As mounting evidence shows genetically modified foods have dangerous health and environmental repercussions, the number of scientists willing to step forward and speak out against them is similarly growing. 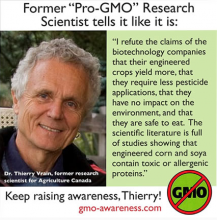 Dr. Thierry Vrain is just the latest of many scientists to buck Monsanto and their hired goons, changing his stance on GMOs and shouting their dangers to anyone that will listen. Dr. Vrain is a former research scientist for Agriculture Canada. It was his job as scientist of his institute to address the public and others, assuring them of the safety of genetically engineered crops and foods. Now, 10 years after his retirement, he’s changed his tune. “In the last 10 years I have changed my position. I started paying attention to the flow of published studies coming from Europe, some from prestigious labs and published in prestigious scientific journals, that questioned the impact and safety of engineered food. The studies commissioned by Monsanto understandably come to the conclusion that genetically modified foods and crops are both safe for the environment and safe for people. They are commissioned by the people who want that outcome. Studies from objective researchers, however, often come to very different conclusions. Vrain says we should take these studies seriously and demand that our governments replicate the studies rather than take the word of biotech giants like Monsanto. Long-term feeding studies on these foods simply don’t exist. We do, however, have studies that indicate disastrous outcomes in rats, where animals fed genetically engineered foods die prematurely. Vrain argues that the entire paradigm of genetic engineering being used in GMO technology is flawed and based on a misunderstanding. It’s this single misunderstanding, compounded with greed, that has created plants that could be toxic to our health. As researchers like Dr. Vrain come forward to voice their opposition to genetically modified foods, we can hope governments and consumers alike will pay attention and demand accountability from corporations like Monsanto. Yeah, got his money first. Pfft to these fence jumpers. Monsanto and these scientists should be ashamed of themselves. They’re killing the planet, mankind and animals and when this all dies then what. These companies don’t care- the gov’t doesn’t care. It’s called greed ??????? Shame on all of you. Monsanto has been poisoning the population since 1901. A pharmaceutical person started the company (that tells you all you need to know right there) and started making saccahrine. 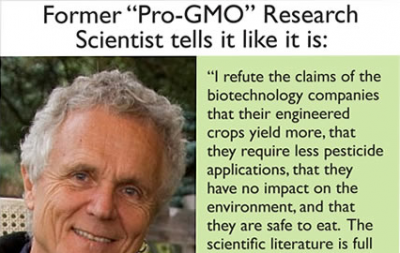 They also produced DDT and agent orange and yet we are supposed to believe that GMOs are safe. Get real, Monsanto. I wish that company would hit bankruptcy status. They will make every effort to keep the secret biological & chemical weapons program being carried out through the food supply ongoing. Secret in terms of not wanting you to know the full scope of the dangers and proliferation in the market.